Does the excitement of E3 have you salivating across your keyboard in anticipation of the next big games on your growing must-have list? We don’t blame you. This year’s slate of upcoming mega-hits spread across some major franchises is a real head spinner. What if you could be among the first to play three hot games from E3 the very moment they go live? This week, PlayStation®Store’s pre-order sale event lets you pre-load the next entries in the Star Wars, Uncharted, and Street Fighter franchises so you can dive-in on day one, instantly! If you’re not a fan of trekking to your nearest game store in hopes of scoring a copy on launch day, now is your chance to skip all of that hassle. 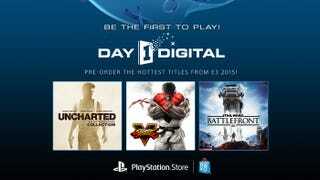 PS4 owners can be among the first to get their hands on Star Wars Battlefront, Street Fighter V, or Uncharted: The Nathan Drake Collection, by pre-ordering these hot games featured at E3 directly from PlayStation Store this week. Then, you can start playing the minute they’re unlocked on launch day. These are three releases you don’t want to miss. Star Wars Battlefront - Multiplayer-focused pew-pew in a galaxy far, far away is shaping up to be a real looker in this authentic homage to the original Star Wars trilogy. Large-scale strategic shooter battle across fave Star Wars vistas? Yes, please! Street Fighter V - Better practice up on your button mashing skills, because this competitive brawler aims to scissor kick the franchise up a few notches with new moves, new mechanics, and new fighters galore. Shoryuken! Uncharted: The Nathan Drake Collection - Get acquainted with the infamous treasure hunter and danger seeker extraordinaire in this beautifully re-mastered collection of the first three Uncharted games. Many of the biggest titles from E3 will be available — get your favorites locked and loaded! Nathan Meunier is a journalist and freelance writer who covers video games, technology, and geek culture. He’s also the author of Up Up Down Down Left WRITE: The Freelance Guide to Video Game Journalism, which is out now on Kindle and in print.